Subtitle: You cannot ever understand the situation facing us at these End of the Age times unless you understand standard Bible teaching about spiritual warfare. Sadly, the Christian Church has not taught this reality for 100 years; yet, events today are marching according to prophecy, with spiritual warfare both in the heavenlies and on earth raging mercilessly. This article will study general Biblical teaching on the existence of, and warfare between, Godly angels and Satanic demons. In the early 1800's, a French philosopher once wrote, "Most people would not recognize Satan even if he had them by the throat". If this sad commentary on the lack of spiritual knowledge was true nearly 200 years ago, such lack of knowledge has only increased exponentially, simply because the Christian Church has not taught its members the reality of spiritual warfare. Today, Satan does have Christians by the throat, and they do not realize with whom they are struggling. But, most importantly, events at these End of the Age times are not only progressing according to Bible prophecy, but they are occurring as the result of the most incredible spiritual warfare the heavenlies has ever seen. God and His holy angels will ultimately prevail over Satan and his Antichrist at the very end of the Tribulation Period; however, prophecy states that the restraining power of the Holy Spirit will gradually withdraw in this interim period in which we are now living, until the point is reached when Antichrist can arise [2 Thessalonians 2:3-8a], with all his hellish power and wickedness. We are living in the perilous times where the Holy Spirit is gradually withdrawing His restraining power, thus allowing Satan's demonic host unparalleled power over this present world, and the greatest opportunity to attack genuine Christians. This unparalleled opportunity for Satan and his demonic host to attack Christians is ironically coming at a time in which the Church is doing the worst job preparing its members to fight such unparalleled spiritual battles; in fact, current spiritual training is the worst in all of history since Jesus' Resurrection and Ascension. We need to return to at least the minimum understanding of spiritual warfare, in the heavenlies and on earth, that Christians of bygone eras knew and understood from Scripture. In this article, we shall examine the basic tenants of this subject, the demonic host, and the latitude God has given them to operate in this dimension. Did you know there was a time in which Satan did not exist and there were no ungodly beings called demons? God originally created angels to serve Him, and to worship Him. God created a most powerful angel whom He named Lucifer [NOTE: Some Bible scholars dispute this interpretation, and neither time nor space will allow me to properly address this issue; but my study of the key passage -- Isaiah 14:4-19 -- reveals that God is clearly speaking to Lucifer through the King of Babylon; only Lucifer could have been in Heaven rebelling against God as is revealed in verses 12-14. Further, God was plainly addressing Lucifer by speaking through the King of Babylon, as Lucifer was clearly acting to influence the actions of the King of Babylon as God revealed occurs constantly in the heavenlies -- Daniel, Chapter 10]. God created Lucifer as the most powerful of all His angels, even making him the Minister of Music! Thus, Lucifer served God in the highest capacity in the eons before God created the world we know today. However, as we see in Isaiah 14:12-14, Lucifer rebelled against God, because he wanted to replace God in the universe. In the Book of Revelation, chapter 12, verses 3-4, we see that Lucifer persuaded one-third of God's holy angels to join him in his rebellion. At that moment of rebellion, God cursed Lucifer, and he became Satan, the adversary . God also cursed the angels participating in the rebellion, and they were transformed from beautiful angels to hideous beasts, instantly transformed into demons, all with a spitting hatred of God and everything belonging to God. Thus, today, Lucifer does not now exist; he is now Satan, God's adversary. Biblical doctrine supports LaVey's belief. We need to make one more point. Black Magick Satanists know that White Magic folk are wielding the same power of the occult as they are wielding; furthermore, the familiar spirits of White Magic practitioners are whispering into their ear the identity of the Black Magick people, alerting them to any possible danger. White and Black Magic practitioners know the identity of each other. God gives us the account of Lucifer's conspiracy against Him in Heaven prior to the creation of both the Earth and its inhabitants. The Dictionary defines conspiracy thusly: "An agreement made by conspirators, to commit a crime or to accomplish a .... purpose through illegal action; A planning together secretly, especially for an unlawful or harmful purpose, such as murder or treason." Thus, Lucifer's act against God in the heavenlies as described in Isaiah 14, above, perfectly fits this definition of a conspiracy. While the Bible does not elaborate, one can only believe that Lucifer had to have been whispering to the angels his plan to overthrow God some time before God reacted to curse him. Thus, Lucifer's plan perfectly fulfills this dictionary definition of Conspiracy. We see the next account of a conspiracy between Lucifer and God in the Garden of Eden . In Genesis 3, Lucifer -- now named Satan, God's adversary -- speaks through a serpent to Eve. He immediately challenged God's commandment which He gave to Adam, and which Adam relayed to Eve. "Can it really be that God has said, 'You shall not eat from every tree of the garden?' " Eve replied that they could eat the fruit from every tree except the tree which was located in the middle of the garden, because if they did touch that fruit, and if they ate of that fruit, they would die. Satan soothingly told Eve, "You shall not surely die". Then, Satan delivered the lie that he tells today through all his secret societies, through the New Age movement, and in all his covens: "For God knows that in the day you eat of it your eyes will be opened, and you will be like God ..." Today, occultists of every stripe believe that a "godhead" exists within each individual on earth, and that to realize this potential "godhood", one has only to meditate, go through occult exercises that "open the centers of vision", and "commune with the holy ones". What did the singer, John Denver, exult one day? "I am becoming a god." Satan deceived Eve to sin, and she persuaded Adam to join her. Satan had won a temporary victory, but God foretold the time when Messiah would come to crush the power of Satan [Genesis 3:14-15]. Satan wasted no time fighting against God, but now he was working through men as well as fighting through his demonic angels. We see him working through Cain, producing mankind's first murder. God cursed Cain, and set him wandering through the land the rest of his life, protected against anyone else murdering him, but bearing God's curse for the rest of his life. In Genesis 6, we see demonic beings appearing on earth, taking human wives, and producing a race of people, half-human, half-demon, whom the Bible calls "giants in the earth", and "mighty men of renown". Bible scholars generally agree that this race of people were what is generally known as "nephilim", the root word for "giants" above. Christian author, Chuck Missler, tells us succinctly who and what these "sons of God" were, and what they were attempting to accomplish. We know these "sons of God", literally "B'nai HaElohim , Sons of Elohim'," cannot be Godly angels because Godly angels would never intervene in God's creation and would never sexually mate with human women. To appeal to human women, these demonic beings had to have transformed themselves into attractive men while in this dimension; otherwise, the human women would have rejected their advances, preferring the human men. Thus, we know these ungodly demons did appear as attractive men, similar to the Godly angels who appeared in Sodom to rescue Lot; these Godly angels were so attractive they raised the lust of the homosexual human men who populated Sodom and Gomorrah [Genesis 19]. The living result of this sexual union between ungodly demons and human womenwas the "giants", literally, Nephilim , a non-human race of creatures. "The earth was depraved and putrid in God's sight, and the land was filled with violence (desecration, infringement, outrage, assault, and lust for power). And God looked upon the world and saw how degenerate, debased, and vicious it was, for all humanity had corrupted their way upon the earth ... God said to Noah, 'I intend to make an end of all flesh, for through men the land is filled with violence: and behold, I will destroy them and the land.' " [Genesis 6:11-13; Parallel Bible, KJV/Amplified Bible Commentary]. We can see that Noah and his family were not infected by this demonic sexual activity. The Bible says, "Noah was a just man and perfect in his generations ..." [Genesis 6:9] Thus, after the Flood, God could re-establish a Godly line of normal human beings from Noah's Sons and their wives, from which Messiah could arise. God brought the global flood, at least partially, to rid the world of these half-human, half-demon offspring. You see, God provided salvation from sin only for mankind, not for angels [1 Peter 1:10-12; Ephesians 3:9-10]. Therefore, if Satan could change mankind from the humans God created to a race of part-human and part-demon [Nephilim, Giants], he could thwart God's plan of Salvation, and he could prevent Messiah from arising. To prevent this take-over of the human race, God created the Flood, which destroyed all these beings. The occult world is very aware of this Nephilim, and of their demonic appearance at the End of the Age; Jesus did prophesy, "... as the days of Noe were, so shall also the coming of the Son of man be." [Matthew 24:37]. Since God destroyed the world in the days of Noah because of the activities of the Nephilim, we can rest assured that they will be present at this time period when Antichrist is about to arise, and to support his activities once he is on the earth. The Bible tells us what punishment God brought upon the demonic beings who transformed into men so they could mate with human women. "For if God spared not the angels that sinned, but cast them down to hell, and delivered them into chains of darkness, to be reserved unto judgement ..." [2 Peter 2:4] God chained these demonic beings, where they remain to this day, awaiting their judgment. This verse tells us much of the activities of Satan and his demons on this planet. While we humans tend to think that this Earth is a pretty big place, Satan just told God he considers it small enough to "go to and fro" and "walk up and down on it". We might use this terminology in discussing our garden plot! [Ephesians 2:2, "Wherein in time past ye walked according to the course of this world, according to the prince of the power of the air, the spirit that now worketh in the children of disobedience."] The Apostle Paul, writing under the influence of the Holy Spirit, called Satan the Prince of the Power of the Air . When God created Adam, He gave him responsibility for this planet, and all its animals [Genesis 2:20], which is the reason God allowed Adam to name all the animals. However, when Satan persuaded Adam and Eve to sin, the title deed to the earth passed to Satan, and he still holds it. Thus, Satan is called the Prince of the Power of the Air , by the Apostle Paul, above. Remember when Satan took Jesus to the top of a high mountain, and showed Jesus all the kingdoms of the world? Satan told Him that, if He would just fall down to worship him, Satan would give Him all the kingdoms of the world [Matthew 4:8-10]. This boast was not an idle one, nor fanciful; Satan could have delivered all the kingdoms of the earth to Jesus, just as he promised to do. Why? Because Satan controls this world, during this era of time; he is the "god of this world" [2 Corinthians 4:4]. Jesus is seen taking back the Title Deed to the Earth in Revelation 5:1-12, but especially in verse 8. This seven-sealed scroll was the Title Deed to the Earth, and in verse 8, Jesus has just taken possession of it in Heaven. From this moment on, Satan no longer is the Prince of the Power of the Air, as the continuous unfolding of prophesied judgments upon Earth proves. Finally, in Revelation 11:15, the angels pronounce, "The kingdoms of this world are become the kingdoms of our Lord, and of his Christ; and he shall reign for ever and ever." Up until this moment in world history [Revelation 11:15], Jesus Christ was not the ruler of this world; Satan was, and is still today, because the events of Revelation are still future. Remember this key point, for it is critical if you are to understand the power Satan wields today; if Satan wants to do something in this world today, he can do it, unless God specifically moves to stop him. Certainly, in Satan's church, Satan can do pretty much what he desires, as long as he does not try to reach out to touch God's genuinely saved remnant. Satan uses both covens and Secret Societies as his church, and it is through this avenue that Satan perpetuates his doctrine and his plan for the ages, passing it from generation to generation. To reiterate, this passage in Job 1:6-7 reveals the activity of Satan and his demonic host. They are continually "going to and fro upon the earth", and "walking up and down on it". The Apostle Paul then adds the understanding that all of the unbelievers were "under the control of the demon spirit" which Satan controls! Unbelievers are controlled by a demonic spirit, a control which Satan has divided among his 7 Principality Demons [Read NEWS1050 for full details]. Thus, Satan and his demonic horde are constantly upon this earth, controlling its people for disobedience against God's constituted authority and His Word! Since Satan is the ruler of this world, God allows him a certain degree of latitude of action which most Christians do not fully appreciate. While it is true that nothing can touch the believer unless God allows it, the same is not necessarily true regarding the unbeliever. Since the unbeliever -- the unsaved -- is in rebellion against God, and is outside God's protection, he is susceptible to Satan's supernatural power. The unsaved can be attacked with virtual impunity; he can be afflicted; he can be possessed. And, as we shall see shortly, the unbeliever is more susceptible to seeing physical manifestations of demons, particularly if he or she has given spiritual authority of their body over to the demonic host by participating in certain sins, like drugs, alcohol, certain sexual sins, or by participating in occult activity. Let us summarize the events of this chapter. In the third year of the Persian dictator, King Cyrus, Daniel began to fast and pray for further Godly insights into God's plan for Israel, especially as it related to the End of the Age. Daniel had previously been given unprecedented insights, but he was not sure he understood them properly, so he asked for more insight. We see in verse 2 that Daniel continued this fast for three weeks, patiently waiting for God's answer. Suddenly, in verse 4, Daniel receives an angelic visitor, an experience that caused Daniel to nearly faint, so much so that the angel had to take hold of him and set him back on his feet. Then, the angel revealed an incredible story. Let us pick up the Biblical account here. "Then he [angel] said to me [Daniel]: 'Fear not, Daniel, for from the first day that you set your mind and heart to understand and to humble yourself before your God, your words were heard, and I have come as a consequence ... of your words. " Daniel must have been amazed at this story. If God given His answer on the very first day of Daniel's prayer, and had informed this angel to deliver His answer to Daniel, why had it taken three weeks for the angel to get to earth? Daniel was undoubtedly aware that an angel can go from Heaven to earth instantaneously; therefore, why did Daniel have to wait for three whole weeks? The angel answered this question, and its impact on our lives will continue until the day we see Jesus Christ! The implications of the angel's answer was huge. This Scripture reveals that a battle between God's holy angels and Satan's demonic host is constantly occurring for the hearts and minds of the human rulers of the nations of the world. In this instance, Godly angels and Satan's demons were battling for control of the mind and heart of the King of Persia, who at the time of Daniel was Cyrus [Verse 1]. However, every King of Persia would have such a battle over his heart and mind, and every King of Greece would have such a battle. In other words, the demonic host was battling holy angels in order to control the mind and heart of the human king so that he would take actions that would benefit Satan and thwart God's Plan. While God has the power at all times and in every instance to defeat the plans of the demonic host, He does not act in every instance to do so. In God's Omnipotence, He sometimes allows the demonic host to influence the earthly king to take actions that seem to further Satan's agenda. Of course, God's Plan will ultimately prevail; but in countless instances throughout history, God has allowed the demonic host to seemingly prevail. We must understand from this passage that such a battle over the heart and mind of earthly rulers occurs in every generation of human history. Satanists are taught that Satan has assigned specific demons to stand at the side of every ruler of every nation throughout history; we can only assume that God has countered by assigning a godly angel for every human ruler in every generation of human history, including the United States of America. Please keep this fact in mind. However, can ungodly demons manifest themselves into this dimension as the ugly demons they are? Will God allow this type of manifestation, and if He does, what are the parameters under which God allows it? Some Christians believe that Satan's demons cannot manifest themselves in this dimension; in fact, a dear Christian friend told me that he does not believe demons can manifest themselves. Only a clear-cut Biblical example will convince such a Christian doubter. Fortunately, the Bible clearly gives us just such an example. The beginning of this sad tale starts at verse 3: "Now Samuel was dead ... and buried in Ramah ..."
That King Saul would even think of enlisting the aid of a witch -- a medium -- for spiritual advice is shocking because he had vigorously rooted out witches from Israel, as the witch's response in verse 9 so indicates. God had ordered that no one in Israel consult mediums, witches, and sorcerers long before King Saul appeared on the scene [Deuteronomy 18:9-14]. In fact, God commanded that all witches and those who practice sorcery be put to death, all the way back in Exodus fully 400 years before King Saul [New Analytical Bible, KJV, 1964, p. 1451]. Once King Saul knew that a witch lived at Endor, he wasted no time going to her. The most important thing to notice about Saul's request is that he spoke of this ritual almost routinely, and he certainly knew of the power of a witch to summon a spirit being through the power of the "familiar spirit" living within her; this familiar spirit is a most powerful form of demon possession, for calling up a spirit being into this dimension requires powerful possession, working through an accomplished witch. King Saul knew she could call up a specific spirit, and after assuring her that she would not be killed [Verse 10] -- invoking God's name -- he asked her for Samuel to be brought back from Upper Sheol, a place Jesus called Paradise. "The woman said to Saul, 'I see a god [terrifying superhuman being] coming up out of the earth!'" [Amplified Commentary] The King James Version seems to indicate that she saw more than one spirit appearing in this dimension. Listen to the KJV rendering: "And the woman said unto Saul, I saw gods ascending out of the earth." However, the witch must have spoken in the singular, because Saul forms his next question in the singular. "An old man comes up, covered with a mantle." Notice the witch did not say that it was actually Samuel, but only that she saw an old man, covered with a mantle. Then, God's next sentence reveals the deception. "And Saul perceived that it was Samuel ..."
Saul perceived that the "old man ... covered with a mantle" was Samuel. The King then bowed down on the earth before the spirit being and "made obeisance". In other words, King Saul acknowledged that he recognized the superior spiritual authority of Samuel, something he generally refused to do when Samuel was alive. Does God exercise this kind of control over a demonic being? Yes, He certainly does. In Job 1:6-7, we see that God required both His holy angels and Satan's unholy angels to report to Him while He was sitting on his throne. God required the ungodly Satanic demons to report their activities to Him! "[Mecaiah] said: 'Therefore hear the word of the Lord: I saw the Lord sitting on His throne, and all the host of heaven standing at His right hand and His left." Let us stop right here to identify the "host of heaven" which the holy prophet Mecaiah saw in his inspired vision. Based upon what Jesus told us about the final judgment, we can safely identify the angelic host at God's right hand as holy angels, and the angelic host at God's left hand as unholy angels, or demons. In Matthew 25:33, we see that the human order at the final judgment shall be the saved on God's right hand [sheep], and the unsaved on God's left hand [goats]. Since the Bible tells us that God is above all evil, and cannot perform evil, we can see that what He has done here is to command a demonic spirit to go to Ahab to whisper a lie in his ear that will cause him to make a fatal mistake on the field of battle. This lying spirit was under God's direct order, and he performed his duty right well: King Ahab was deceived, and then killed, in battle [verse 33]. We see a similar scenario in 1 Samuel 16:14, as the hand of God began to move against King Saul. "But the Spirit of the Lord departed from Saul, and an evil spirit from the Lord tormented and troubled him." God commanded an evil spirit -- an ungodly demon -- to come to King Saul to trouble him as part of His divine judgment against the King. In 1 Samuel 18:10-11, and 19:9-10, we see that another evil spirit -- an ungodly demon -- acting under God's direct orders, persuaded King Saul to try to kill David; however, the Lord ensured that David escaped. "The next day an evil spirit from God came mightily upon Saul, and he raved madly in his house, while David was playing on his lyre with his hand ... and there was a javelin in Saul's hand. And Saul cast the javelin, for he thought, 'I will pin David to the wall'." Since God does not want to advertise the exact Satanic ritual that mediums must do in order to bodily call up a spirit into this dimension, the Biblical account skips right over the witch's ritual in this account. But, the witch surely had to perform a ritual between verses 11 and 12 of chapter 28. Therefore, I asked a former Black Magick practitioner, to describe for me exactly the type of ritual this witch would have had to perform if she wanted to bring a demonic spirit into this dimension. Since the world of Satan and his demons has a considerable degree of hierarchy, and lines of communication, all witches have to know exactly the procedure Satan has established so that human mediums can access his supernatural power, and control his demons in this dimension. This knowledge is the very essence of Witchcraft. Human mediums must be very careful in the way in which they perform this ritual, for no demon wants to be forced into this dimension, in order to do the bidding of the human being performing the ceremony; if the medium makes any mistake, no matter how small, the demon has permission from Satan to attack and kill the witch. Therefore, mediums take great care to the smallest detail in carrying out the ritual. This is what the Witch at Endor -- known in occult lore as Gilgamesh -- would have had to do in order to raise this spirit disguised as Samuel. The great god Ea of the Akkadian cosmos is the only god capable of forcing the god of the underworld, Nergal, to release the spirit of Enkidu in order that Saul may supposedly speak with Samuel. The operation is accomplished by prayer unto Ea; no sacrifice needs to be offered if the necromancer is powerful enough; the result would appear as a spirit, as it would iose up like a wind. Occultists believe that the demonic god who thus came forth was Enkidu, disguising himself as Samuel. Demons who are forced to materialize always complain bitterly about being forced into this dimension. Thus, we should not be surprised when this demonic being -- whom Saul assumes is Samuel -- complains in verse 15: "Why have you disturbed me to bring me up?" This complaint is heard nearly every time a witch performs a necromancy ceremony, as the demon does not want to be under the control of the human medium. If the necromancer is not powerful enough to cause the spirit to arise with a simple prayer to the god Ea, then this is the ritual required. The medium would first pray to the god, Ea, and then begin preparations for a ritual sacrifice. After drawing the "sacred" symbols required by the specific ritual, the necromancer would have dug a trench with his sword, poured libation of honey, wine and water round it and besprinkled it with meal; he then would make vows and utter prayers to the NATION of the dead, filling the trench with the blood of slaughtered sheep, whereupon the souls of the perished would come thronging forth from the supernatural realm. However, the most important knowledge the necromancer must know is the "ineffable name" of the god, Ea. This "magical name" brings forth the kind of power that the ritual requires to be effective. This name, mysterious and divine, is the greatest and most irresistible of all the powers of magic. Ea, god of the earth and sea, is the only being in the whole universe who knows the secret word. When it is uttered everything bows down in heaven, on earth and in the infernal regions. And this name alone can subdue the seven maskim and stay their havoc. The gods themselves are bound by this name and obey it. Thus at the very dawn of history we meet the power supposed to reside in ineffable names which has blazed a broad trail through ritual magic. In Egyptian magic, the magicians claimed to know the mystic and hidden names of the gods, and to utter these in order to control them. Ritual Magick requires the use of the Ineffable Names of the key gods of the infernal region. Thus, when Freemasons lay great stress upon the "Ineffable Name" of "God", they reveal their truly dark nature. Masonry traces its roots back through the Egyptian Mysteries, so it is natural they would speak much of the "Ineffable Name" of "God", even though the Bible mentions it not once. 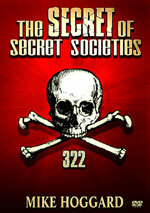 Do not be deceived as to the true occult nature of Freemasonry. We do not know whether the Witch at Endor was powerful enough to be able to call the demonic spirit disguising himself as Samuel by simply praying to the demonic god, Ea, or whether she had to perform the ritual sacrifice described above. It is not necessary for this discussion to know this detail. What we do know is that King Saul knew this Witch of Endor routinely called up spirits into this dimension, and that when he requested her to call up Samuel, a demonic being did appear in this dimension, pretending to be the prophet. As we have stated before, Satan is the "Lord of this world", and can do most of what he wants to do unless God specifically reaches out to prevent him. Witches routinely call demons into physical manifestation, as this picture details. 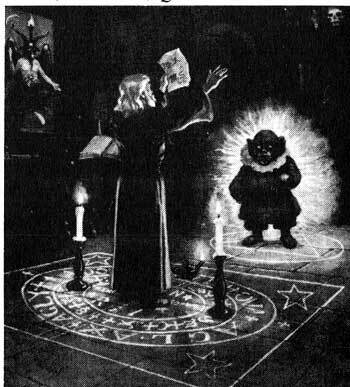 With Eliphas Levi playing the role of Wizard -- reading from the spell book in his hand -- the demon is conjured into this dimension, appearing within a circle that has a triangle painted within. Notice the Baphomet on the extreme upper left and the human skull in the extreme right. Thus do Satanists place great emphasis on symbols drawn on the floor or the ground. They use such symbols during powerful witchcraft ceremonies. Former Master Mason/Wizard/Mormon William Schnoebelen clearly states the ability of mediums to call spirit beings into this dimension. Listen to his testimony, for this is corroboration from the right here and right now, i.e., this present age. "In witchcraft, our challenge was to conjur and control spirits and use their power without being hurt in the process." [Mormonism's Temple of Doom, by William Schnoebelen & James R. Spencer, 1997, 8th Printing, p. 12] Remember our earlier statement that a witch or wizard pays close attention to even the smallest detail in a ritual, for if they made even a tiny mistake, the demon being ordered into this dimension could kill them? Schnobelen has just confirmed this fact. Praise God that Mr. Schnoebelen is now Born Again and serving Jesus Christ! In countries around the world that do not have the tradition of Fundamental, Bible-believing churches as does America, demons regularly manifest themselves in this dimension. I fear that, since America has moved far from God in past decades, we shall see this phenomenon with increasing regularity, beginning within established Satanic circles, of course. We Born Again Christian believers do not ever have to worry about demonic manifestation, because we are protected by the shed blood of Jesus Christ. But, our friends, neighbors, and even family who are not saved might bring any of us into contact with such demonic activity, so we must be aware that such demonic activity is raging all around us, and affecting us indirectly. "How can we expect our children to respect authority when our involvement in an ancient mystery religion [Freemasonry] has opened the floodgates of desire into our homes ... Children have acute noses for hypocrisy ... if they know their Bibles at all, they will easily see that Dad should not be shuffling off the Lodge meeting every Monday night ... although most kids will probably not know very much about the Masonry their father and/or mother is involved in, the fact that their parents are members of the 'world's largest coven' brings the sin of witchcraft into the home." 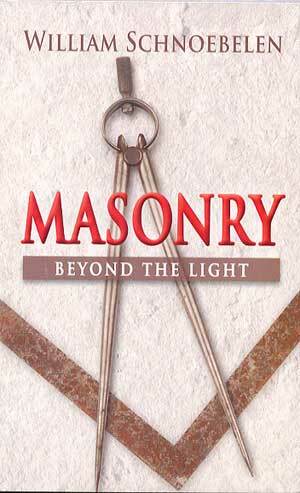 [Masonry: Beyond The Light , by William Schnoebelen, 1991, p. 235-6]. A father involved in Masonry, and/or a mother who is a member of Eastern Star, is bringing active demonic beings into their homes, to afflict their children! The actions of the parents do dramatically afflict their children! Spiritual warfare is real, and all a demon is looking for is a "doorway" opened by someone in their life, or by someone in authority, like a father in a home. Spiritual warfare can reign mightily in the home of a Freemason. But, spiritual warfare can reign mightily in a Christian home if the parent has allowed a 'doorway' to be opened, such as sexual sin, alcohol, drugs, allowing children to watch Rock Music, to play a Ouija Board, or some other occult "game", or by watching too much of any of this stuff on TV these days. What parents do has a major impact on their children within the home! Spiritual warfare is occurring mightily in this world. If Satan has you by the throat, would you recognize him? Truly, in this End of the Age time period in which we live, such demonic activity is at its highest level since the first advent of Jesus Christ. Are you spiritually ready? Is your family? Are you adequately protecting your loved ones? This is the reason for this ministry, to enable you to first understand the peril facing you, and then help you develop strategies to warn and protect your loved ones. Once you have been thoroughly trained, you can also use your knowledge as a means to open the door of discussion with an unsaved person. I have been able to use it many times, and have seen people come to Jesus Christ as a result. These perilous times are also a time when we can reach many souls for Jesus Christ, making an eternal difference. If you have never received Jesus Christ as Savior, but have come to realize His reality and the approaching End of the Age, and want to accept His FREE Gift of Eternal Life, you can also do so now, in the privacy of your home. Once you accept Him as Savior, you are spiritually Born Again, and are as assured of Heaven as if you were already there. Then, you can rest assured that the Kingdom of Antichrist will not touch you spiritually.